It's officially fall and when the pumpkins start showing up in the Farmers Markets along side the country roads, it is time to get out the pumpkin recipes. 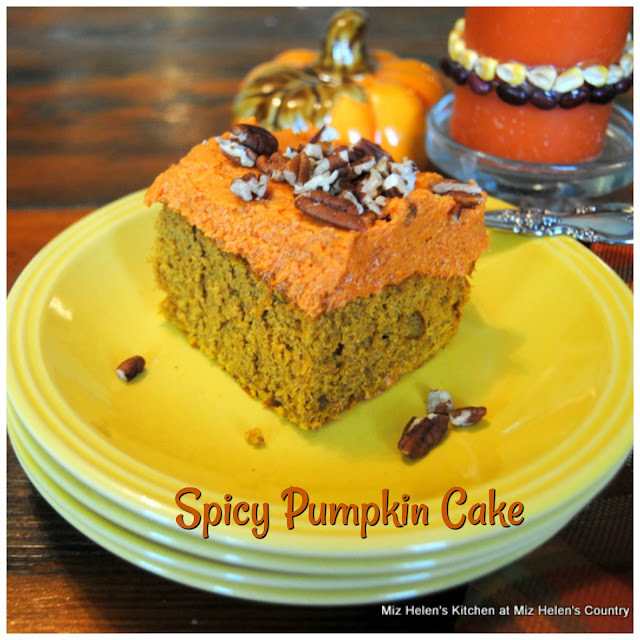 The Pumpkin Cake recipe that I am using today was my Aunts recipe that I have made a little easier, and gave it a fantastic frosting. Aunt Ann you will never recognize your recipe, but I will never forget where the inspiration came from and the wonderful role model that you were for me, thank you! Mix the cake mix, eggs, vegetable oil, pumpkin puree,(reserving 1 cup for the frosting) cinnamon, all spice, and pumpkin pie spice. Mix in a large bowl until mixed well. Add the drops of food color and blend until the color is right for you. Pour into a sprayed 9X13 baking pan. In a medium mixing bowl whip the butter until very smooth. Add the pumpkin puree (reserved from the cake) and the pumpkin spice. Add the food color and mix to your desired color. Add the powdered sugar a cup at a time and mix well. Continue to add and mix the powdered sugar until the frosting is right for you. Frost the cake and garnish with chopped pecans. I am so excited to share this warm fall recipe, it is delicious and I sure hope that you and your family enjoy it as much as we have! Have a wonderful week and come back to see us real soon! It's that pumpkin time of year! Thanks for joining the What's for Dinner party! Hope we see you every week. Have a wonderful day.